For achieving a perfect ombre look, there is no better way than wearing ombre hair extensions. But, how to get the perfect ombre extensions? What to look for while buying ombre extensions? Here are a few useful tips. How to Choose Ombre Extensions? Not all ombre extensions are created equal. Check how the set of extensions look before you buy. Make sure you purchase locks that have a great ombre fade and blend. The fade is an important part and it should be as natural as possible. For example, the most popular shade, chestnut brown ombre is the most natural fade and also blends well. Even lighter ombre can work well if you get them cut and blend them or if you have already ombre hair. If you are short-haired, ombre hair extensions can be your best friend, because you can change the color effortlessly with the extensions. Also, you need not color your own hair; so, you can save your money as well as your hair. Just make sure to get the extensions cut and blended in the salon to achieve the most natural look. If you have longer hair, you will have to get your ends already ombre to ensure the extensions you select match your existing ombre hair. If your long hair have one solid color and you try to wear ombre extensions, it won’t look natural and will be easily identified that you are wearing extensions. 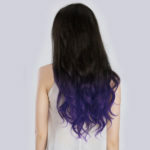 Therefore, carefully choose a base and ombre color that match well with your ombre hair. Remember that you can choose between 1 to 3 shades up or down within your ombre colors and that will blend well. Consider using a color ring or sample to compare with your own hair. Make sure you get the ombre hair extensions cut and blended in the salon. This will make the extensions undetectable and will bring a dramatic difference to your personality. Mass produced ombre hair extensions result in poor quality. Such extensions don’t look natural and can break your look. A lot of mass production companies don’t take the time to carefully achieving the ombre fade. You can see straight lines or even no blend at all in such extensions. Any harsh lines or bad blend will reveal that you are wearing low-quality extensions. Therefore, remember to examine what you are buying. If you take care to buy only high-quality ombre extensions with these tips, you can achieve the look you want and can make eyes turn to you.